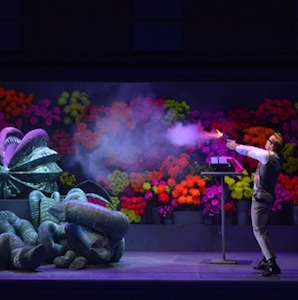 “Little Shop of Horrors”–this is an all black-humoured comedy whose star is actually a carnivorous plant. It is changing the lives of the characters in a small flower shop in an area in New York that is so run down that no one there is interested in flowers. This voracious monster, intemperate, rapidly growing and truly outrageous, however, causes a sudden success, and by some miracle it comes suddenly better to the people. However, this sensation brings a whirlwind of events, devouring them all in the end–in the truest sense of the word. Each of the figures is an original. They actually all have star potential in their exaggeration, each in their own way. The authors, Howard Ashman and Alan Menken, they have finely characterized each of them in the dialogues and the wide-ranged music, from a cool groove of the late Sixties to highly dramatic moments. Three Soul Girls interact like an antique chorus commenting on the action. They carry the spirit of the Sixties inside, which I have been looking with my designer Cordelia Matthes. They not only look gorgeous, but could not be more cool with their dry comments on the bloody events. Within the music and the figures there’s pulsating a lot of energy. There is a tremendous moving momentum in the piece, and the plant symbolizes this immediately. The figures flourish and develop new life before they are eaten. Everything is getting faster and more colorful, more shrill and just „more“–the piece itself is one big crescendo. Staged and choreographed by Milan born Giorgio Madia. A stroke of luck! “Little Shop of Horrors” in my eyes is the first production of the house in recent years, which has world class. The production would have earned yet to run long at the new location [in Dresden City Center] and to advance to a small cult piece particularly among young people of Dresden. Giorgio Madia gave his acclaimed debut [at Staatsoperette Dresden]. He staged the black comedy in the spirit of the Sixties, as entertaining, fast-paced show with lots of ballet. Giorgio Madia […] relies entirely on fun and black humor. The whole evening had punch, is created on a speedy pace, and radiated from a brightly coloured energy, living from revue elements. Sets and costumes by Cordelia Matthes are eye-catching; the energetic, quick direction is responsible for the remarkable momentum of this “Shop of Horrors”.